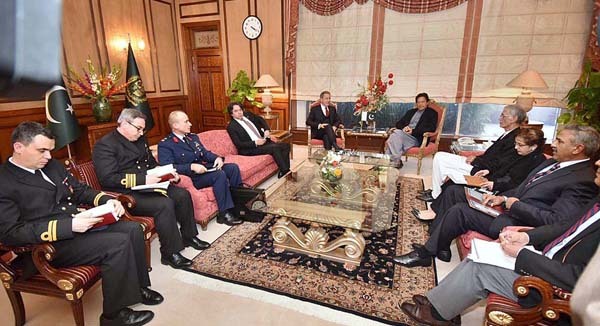 ISLAMABAD, Dec 20 (APP):Expressing satisfaction over the upward trajectory of Pak-Turkey relations, Prime Minister Imran Khan Thursday said Pakistan was keen to further strengthen its cooperation with Turkey in all areas of mutual interest including trade and defence. He expressed these views in a meeting with National Defence Minister of Turkey General (R) Hulusi Akar here at the PM Office. Minister for Defence Pervez Khattak was also present during the meeting. Welcoming the visiting dignitary to Pakistan, the prime minister said Pakistan greatly values its ties with Turkey and the people of Pakistan have great respect for President Recep Tayyip Erdogan. “We admire the socioeconomic progress made by Turkey under the visionary leadership of President Erdogan”, he added. General (R) Hulusi Akar felicitated Imran Khan on being elected as the prime minister of Pakistan and conveyed greetings from President Recep Tayyip Erdogan. He said the Turkish leadership looks forward to the visit of prime minister to Turkey which would help further strengthen the existing ties between the two countries. General (R) Hulusi Akar expressed Turkey’s deep appreciation of Pakistan’s efforts and sacrifices made in the war against terrorism. Regional situation was also discussed during the meeting.